Relax and entertain your guests as you enjoy impeccable service from Le Mistral. Catering menus crafted by Chef David Denis will feast your eyes and indulge your appetite, and can be customized to suit your dietary and allergy needs. Chef’s Table: Located in the heart of Le Mistral, the restaurant's kitchen, the Chef’s Table offers a very unique dining experience with the full attention of Chef David Denis on you and your guests for the evening. 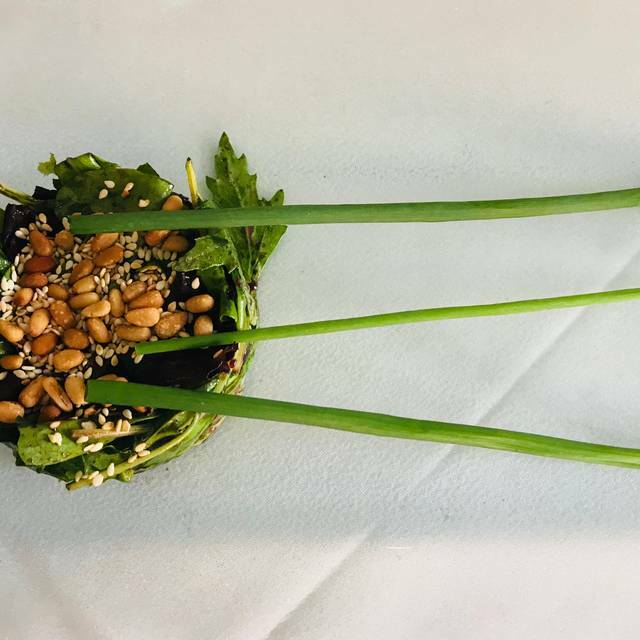 Chef Denis will customize a special menu that caters to your individual preferences for up to a total of 8 guests, as Sommelier Sylvain Denis recommends wines from around the world to complement your five-course meal. Wine Cellar: Located off the main dining room, Le Mistral’s wine cellar is perfect for special occasions and more intimate gatherings of up to 12 guests. The private setting showcases an impressive wine collection and is very popular among Le Mistral regulars. Everything at Le Mistral is excellent. 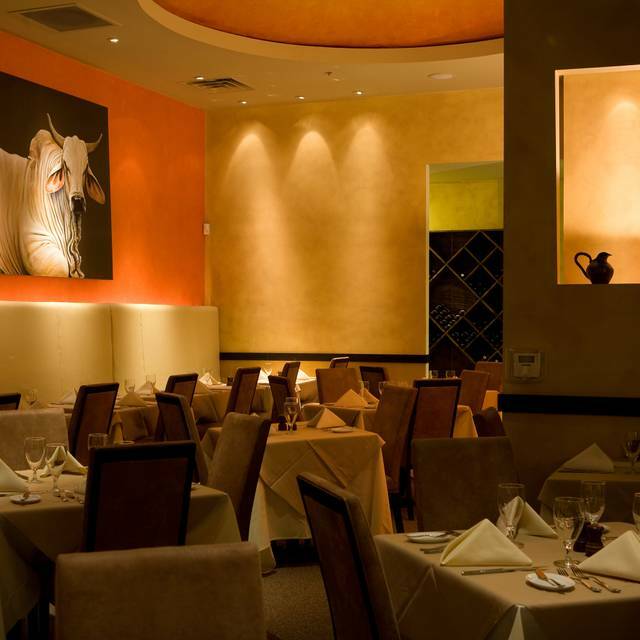 The food is delicious, the service impeccable (Sofiane is our favorite), and we always leave happy. 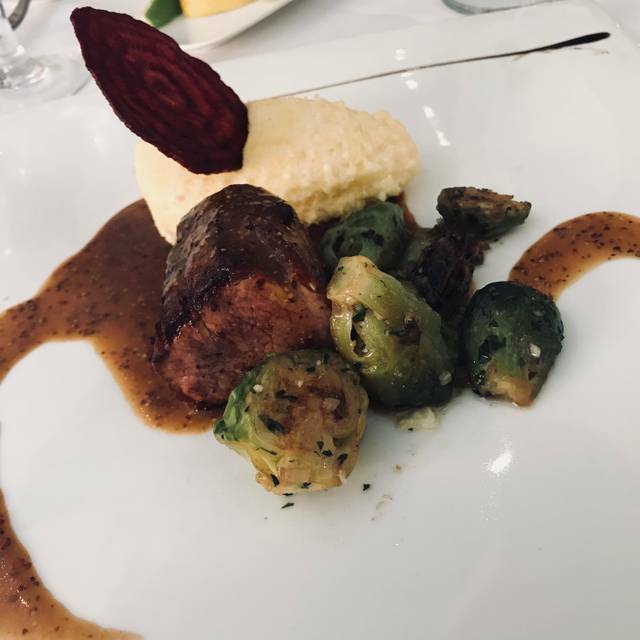 It’s a great place for a special dinner and also great for lunch - the lunch menu has very reasonably-priced lunch entrees if dinner is too costly for your budget. Some of our favorites include the lobster risotto, sea bass, French fries, and chocolate fondant. 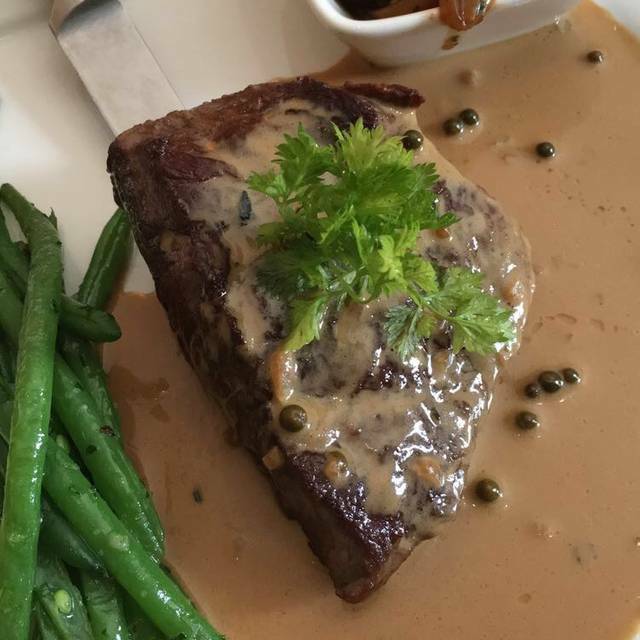 The restaurant, food, and service at the Le Mistral restaurant was outstanding. The only problem encountered was upon returning home, we had a telephone call from the restaurant and two or three e-mails from Open Table asking why we had not showed up for our reservation???? We had a 5:30 reservation and arrived at 5:25, and were seated at 5:30. We were the only 5:30 reservation and no other diners showed up until 6:00. Could not understand the confusion. Service was slow and inattentive. Food was good and ambiance was pleasant as always. When we go to eat at a french restaurant, we HAVE to get escargot. Le Mistral’s is very tasty. The snails were perfectly tender and highlighted by their garlic butter that kept them bright without being overpowered. The business lunch special is a fantastic value. Soup or Salad, daily changing entree, and dessert for under $30. Yes, please. I had the Mistral salad which was lovely dressed with blueberries and zippy balsamic vinaigrette. But, the shining star was the entree- Seared Shrimp kebabs over spinach risotto with a cognac sauce. Deliciously decadent! I know I will be craving that dish for a while to come. A beautifully light sorbet finished off the meal. My mother lIves near here, and although it was our first time dining at Le Mistral, she sees herself as a future frequent diner, and cannot wait to bring all of her gal pals here. I was allowed to make a reservation 30 minutes before closing. However, we were rushed through our meal and then told we could not order dessert. When asked for recommendations, we were told “everything is good, just pick something.” I believe the quality of a restaurant should be judged on how they treat every customer, from the first to the last. If the restaurant cannot support reservations made within 1 hour of their closing, then they should not allow reservations during that time. For this alone, I will not dine at this restaurant again. First time at this restaurant. 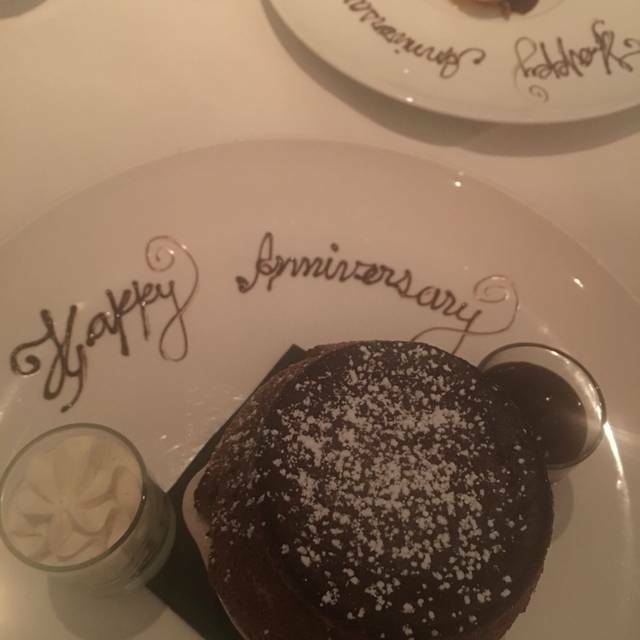 My wife and I chose Le Mistral for our anniversary dinner, and we were very happy we did. The waiters were attentive, friendly, and fluent in French. The food was delicious - the osso bucco was outstanding. For dessert, we had a chocolate souffle that was incredible. We have already recommended this restaurant to our parents, and we will definitely be back again! Lovely dining and we had a 10 month old little grandson with us. He was so happy to be there and smiled at everyone who paid attention to him. The food was superb and also the ambiance in the restaurant. We ( my daughter ) and I enjoyed so much everything about the service, food and the courtesy we received from the staff. A lovely afternoon in a lovely place. Amazing service by our great waiter sofiane. Recommend a great wine for my wife which she really enjoyed. The food was great as well. We had the ravioli and the filet mignon as our entrees. Couldn’t have asked for any better service and food. Will definitely be coming back again soon! We sat at the bar for pre-dinner cocktails and were bombarded with barmaid conversation that included the “f”word in every sentence. Moved to the table and had exceptional service and food. Thankfully we were almost finished when a table of four was seated next to us that was wearing overpowering cologne. People please be considerate—not everyone will enjoy your selection of scents!! Fish and lobster very good and fresh. Chocolate soufflé superb. Attentiveness very good but not over the top. We hosted a retirement lunch for a colleague of ours for 8 people. The service was excellent and we were truly taken care of. The food was very good and extremely good value. Really happy with how the whole event went. Fantastic experience. Great food, drinks and service made for an excellent date night! Best restaurant in Houston! We ordered the business lunch. Absolutely delicious!!! A great value and a beautiful meal. The entire service team is exceptional- from the moment we entered everything was perfect. We had a private chef's table for a party of three. It was an amazing experience with 4 courses of food prepared especially for our tastes. The chef was trained in France, and the level of artistry and preparation was unmatched. We had incredible service and each course had multiple unique samples displayed beautifully. I highly recommend doing this for a special occasion! Got the "Business Lunch" and it was delicious. Perfect portion sizing too. Service was down a notch from outstanding. One entree was served first but to the wrong person. We didn't realize the error till the second entree arrived a few minutes later from a different server. We enjoyed excellent Scallops and onion soup for appetizer, both were exquisite. 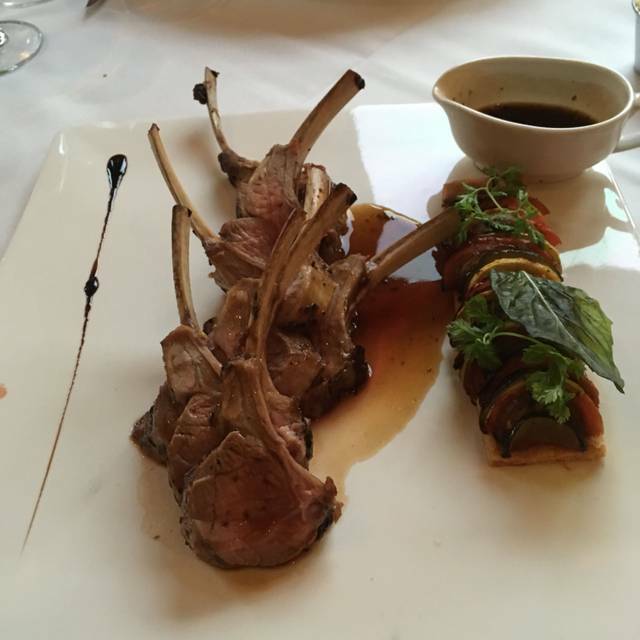 Our entrees included Rack of Lamb and Chilean Sea Bass. The Lamb chops were delicious; however the bass was mediocre; not something we would order again. The service was outstanding. Only disappointment was the ambiance: plastic chairs, frayed carpet; and 1 x4 poorly painted pine for chair molding seemed out of place. This is not a place we would describe as romantic or elegant. Our server Carlos was great! Attentive and pleasant. Thoroughly enjoyed our ladies lunch at Les Mistral. Love this restaurant, the food, the service, the ambiance. Love, love, love their soups. For the lunch special, it was tomato soup that was so delicious. (They should bottle it and sell it at HEB Central Market.) Always my first place to go to lunch out in west Houston when I have to make the long trek out there. Thank you for the Great review! We strive for perfection with every bite. Come back again and dine with us for your next special occasion! We had an excellent dinner. Service was friendly and attentive. The snails were a good choice to start. We had 5 people and all were very happy with the main course. The fish was particularly good. The deserts were excellent. Favorites were the chocolate soufflé and the creme broule. Highly recommend. Not an inexpensive meal but worth the occasional splurge. Food not so much better, if at all, than substantially lower priced similar restaurants. We love Le Mistral and make the trek out to it every year! The foie gras, escargot, french tacos, and osso bucco are family favorites! What a fantastic restaurant!!! Enjoyed my birthday dinner at Le Mistral tonight. The lamb dish was beautiful ,well prepared and delicious. 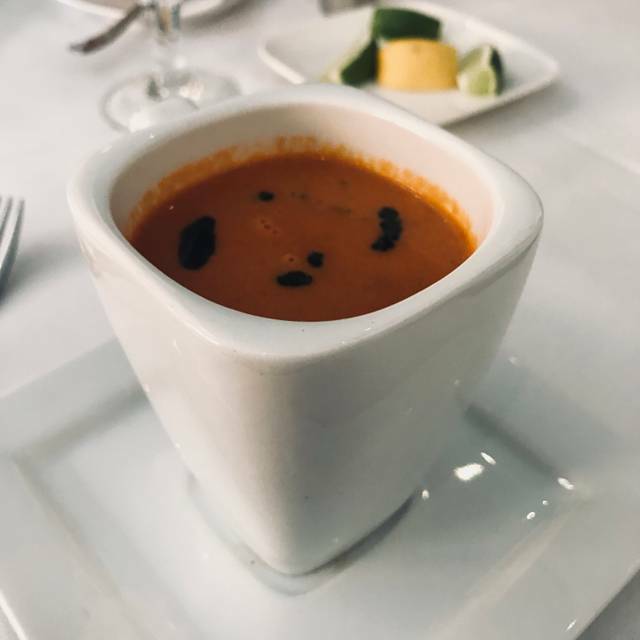 My husband enjoyed the Lobster Bisque and French Taco appetizers- both very tasty, fresh, and the perfect portion size. The hostess was very pleasant and welcomed us as we entered. Our server, Dylan was fantastic- attentive, polite, friendly, and met our all our needs. The entire staff was gracious, professional, and made the evening one to remember. Highly recommend Le Mistral!!! Our meal at Le Mistral to celebrate my birthday was heavenly. Dylan provided stellar service and was very attentive and caring. 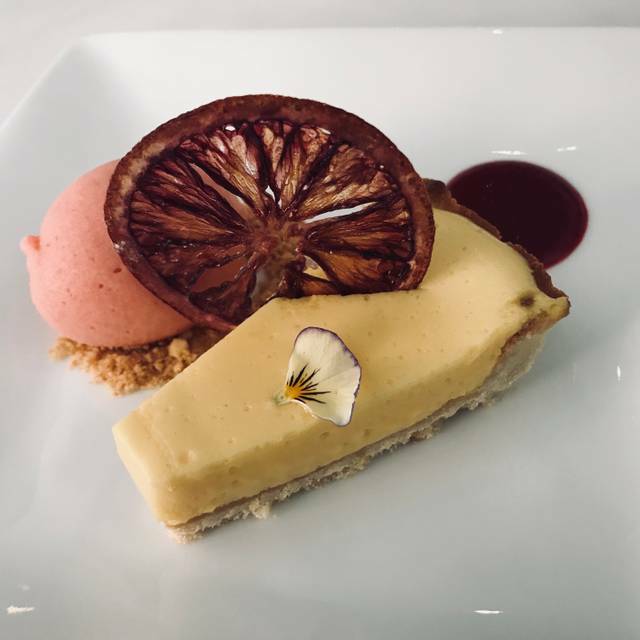 We would definitely recommend Le Mistral to friends and family and will be back next week when we have family visiting from Canada. 5 Star experience and the menu/food was outstanding. Nous avons ete tres surprises de la note! Nous avons commande deux verres de vin blanc, on nous a propose du chablis sans nous dire que le verre coutait 16 dollars! Ca fait un peu cher tout de meme! Il eut fallu que nous demandions la carte des vins ou, pour le moins qu'on nous la propose! Ce qui n'a pas ete fait. Pas de rancune, je reviens ce midi au Mistral...Peut-etre beneficierai-je d'un petit geste commercial? This place is on the spot every time. Sofiane is our all the time server and he is great. I always request to get the Beef Wellington and it is as good as it gets coming from a person that doesn't eat a lot of beef highly recommended. The pistachio souffle is awesome as well. Give this place a try and you will be hooked as I am. 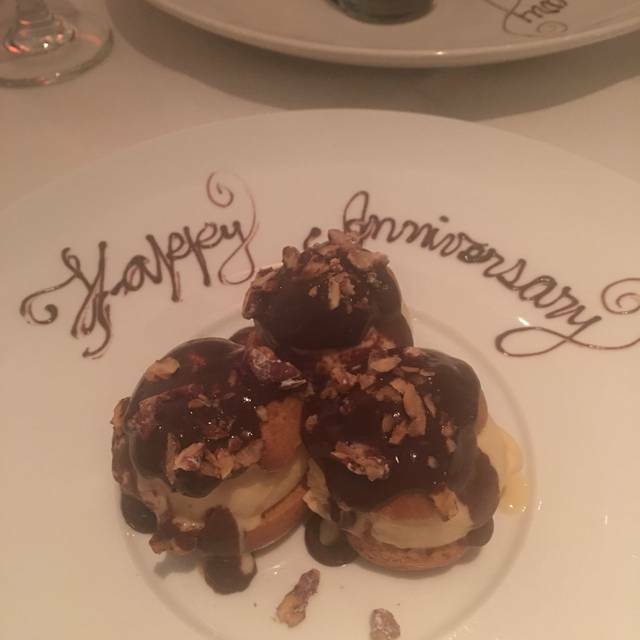 It is always a pleasure to return to Le Mistral for dinner, especially for a Birthday celebration. I cannot fault the quality or the food or the standard of service which is consistently very good. Great food and atmosphere. Highly recommend the chocolate soufflé (be sure to order with your meal). Food was amazing, service was amazing. had a great valentines dinner.